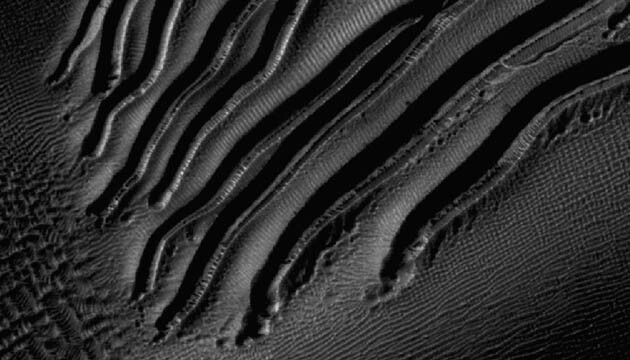 It's Dune-Boarding Season on Mars! Ah, the yearly refresh of spring. Temperatures are warming, snows are sublimating, large sheets of dry ice are breaking free from dune tops and sliding like giant snow boards down the sandy slopes…. Doesn't sound like the spring thaws of Earth, much. NASA's Mars Reconnaissance Orbiter and its high-powered HiRISE camera, which has been capturing extremely detailed pictures all over the surface of Mars for a few years now, has happened upon a number of surprising, curious and often captivating landscape features, many of which have inferred the action of dynamic weather processes on Mars. Far from being the dead desert world that it first appeared in the 1960's, images from MRO and other orbiting spacecraft, as well as several landers and rovers, have revealed that Mars is alive with activity—maybe not alive with actual life, but certainly a world that exhibits daily and seasonal weather patterns that we would find familiar, as well as some that we would not. There's an image captured by MRO that shows a downhill-slithering brigade of channels that present a different appearance than others that look more like the features of liquid-carved gullies and streambeds. The long trenches gouged in the sandy slopes have an almost hair-like pattern, rooted at the tops of their runs and cascading downhill to blunt ends at the bottom. Fluid-carved channels typically wind in a side-to-side meander and often end in dendritic fans where the fluid and the solids they carry spread out and dissipate. Whatever dug out these luge-chutes were probably solid, several meters across, and at the end of their run disappeared. Chunks of frozen carbon dioxide -- or dry ice -- forming in sheets on the dunes over the winter and breaking off during the spring thaw is one process that fits the bill. Their disappearance at the end of the run would be explained by the dry ice doing what we know it does best: simply sublimating away directly into its gaseous state, leaving behind only a dry depression where it came to rest. And though huge slabs of dry ice sand-boarding down the faces of dunes (full-body sand-boarding is something I enjoyed doing on dunes in Death Valley when I was a kid) is an exotic example of the weather in an alien environment, reports from the Red Planet include other headlines. Dust devils, a common sight in the windy deserts on Earth, also seem to be common on Mars—which is almost entirely windy desert. MRO has captured images of looping and arcing streaks left behind by packs of roving dust devils, and at least one of the Mars Exploration Rovers not only captured video footage of some from the ground, it was also run over by one. Strange, dark, burst-like blemishes have also been imaged in the Martian spring, thought to be outbursts of dust-laden carbon dioxide gas breaking free from layers of water, ice and permafrost as the season grows warmer (or, actually, less frigid). Still more! NASA's Phoenix lander detected aerial snow from its location near the northern polar ice cap—a snowflake version of virga, perhaps. As far back as the Viking lander missions, we have known of ground frost. And even from Earth, before the first robotic probe was sent to Mars, we witnessed the seasonal cycle of growth and decline of the polar caps, as well as the global wind and dust storms that envelope the planet's entire surface each Martian year when it passes closest to the Sun. Not a dead, lifeless planet at all. Meteorologically speaking, Mars is more exotic and often livelier than certain desert realms on Earth. So, grab a board of dry ice and hit the slopes, dude; it's dune-boarding season!